After meeting with Mike and Kristin Nance for the first time, I could tell they knew what they wanted in a website, but needed some help in “Just making it happen”. Our ideas unfolded and we brainstormed together. As I listened, I began to visualize! We got started and it really turned out eye catching. To read more on this project visit my portfolio. 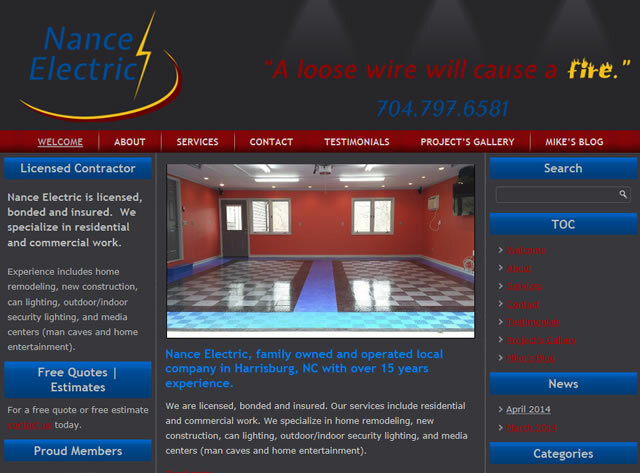 Nance Electric, family owned and operated local company in Harrisburg, NC with over 15 years experience. They are a licensed, bonded, and insured full service electrical company serving the Charlotte, NC area near Harrisburg, NC, Matthews NC, Kannapolis NC, Salisbury NC, and Huntersville NC. They offer a wide range of residential and commercial electrical services. They specialize in home remodeling, new construction, can lighting, outdoor/indoor security lighting, and media centers (man caves and home entertainment). Mike Nance, electrician, is committed to safety and integrity. He is licensed, bonded and insured. Designed their logo, marketing card, and responsive WordPress website as a CMS tool which includes Mike’s Blog, where he offers electrical advice, tips and more.